Club Penguin Cheats by Mimo777 Club Penguin Cheats by Mimo777: Vote on a name for Gary's puffle! Hey guess what everybody! Our friend Gary is adopting his first ever puffle! And he needs help naming it! 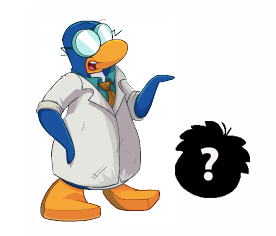 Go to our Penguin Poll and cast your vote! I think he should name it Darwin! I think Darwin because it sounds a bit smart. I want to see the dinosaurs again too! They were fun last year so this year I think it will be better! And they are bringing the new Stegosaurus out too so it is awesome.